You can upgrade your Free Pass to a Battle Pass in Fortnite Battle Royale. For Season 1 and Season 2, the cost to upgrade was 950 V-Bucks (The equivalent of approximately $9.50). 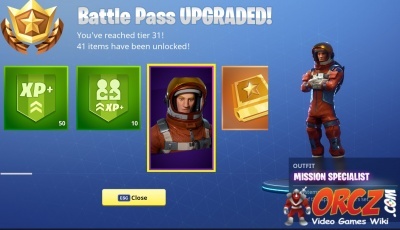 Upgrading to the Battle Pass lets you earn more rewards and level up faster. When you upgrade, a screen will pop up notifying you what tier you are at and what items have been unlocked. Upgrading your Battle Pass will retroactively unlock all rewards up to that level. If you purchase the Battle Bundle when upgrading, you will start at a higher tier. This page was last modified on 18 March 2018, at 23:57. Content is available under Creative Commons Attribution Non-Commercial Share Alike unless otherwise noted.